Since July 2008, the coastal town of Colonia de Sant Jordi, in the municipality of Ses Salines, houses the Interpretation Centre of the Cabrera National Park. 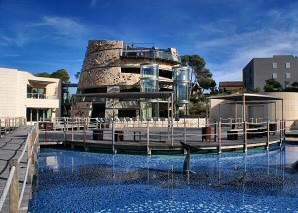 Located in a new building in the form of a circular talayot, the centre shows the main aspects of the natural environment of the archipelago. Videos and interactive displays allow visitors to learn about its geology, flora and fauna and different aquariums simulate an immersion in its waters to show the great diversity of its marine environment. Admission is free and visiting hours are 10 am to 2.30 pm and 3.30 to 6 p.m. Visitors can choose between a guided tour or a self-guided visit.